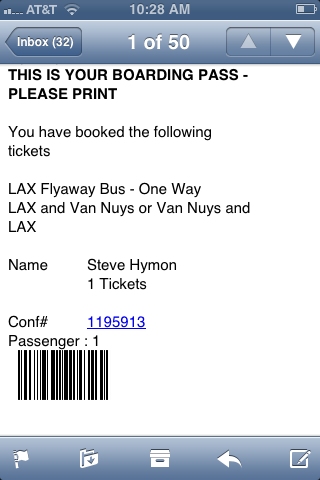 LAX FlyAway tickets on Union Station and Van Nuys routes now available online — and you don’t have to print them! I checked it and it works! It was easy-peasy. Photo by Steve Hymon/Metro. On-line purchased tickets are good for up to 30 days after purchase date. At time of boarding, customers can present printed confirmation as a boarding pass or have the capability to access the confirmation e-mail on their phones to be scanned by the bus driver. Airport officials noted that the bar code is good for as many scans as the number of tickets purchased in a single transaction. There is no need to print multiple copies of the confirmation unless passengers are traveling separately. Tickets are $7 per passenger each way, with children five years old and under riding free (limit two per paying passenger). All major credit cards are accepted. Cash is not accepted at this time. On-line ticketing for the LAX FlyAway® between Westwood and the airport is expected at a future date. Passengers ride dedicated, clean-fuel, high-occupancy buses to reduce ground traffic congestion and vehicle emissions around LAX and the region. LAX FlyAway® bus service is also in compliance with Americans with Disabilities Act requirements. For additional information on the LAX FlyAway® log on to www.lawa.aero/flyaway or dial1-866-IFLYLAX (1-866-435-9529). I love this. This will make FlyAway even better/easier than it already is! Next up would be real-time arrival info… that’s be very useful while waiting at LAX for a bus. The name attached to the pass can be an issue. Can one person buy 2 round-trips in a single transaction, for themselves and a companion, and then have it scanned for each? About a year ago, I rode the Metro to Union Station, bought fly round trip tix for the FlyAway. Rode the FA to LAX, upon my return, a relative decided to pick me up at LAX. So I gave away my prepaid FlyAway to a lucky by-stander that was going to Union Station. Would the name on the ticket pose a problem? If Metro Buses uses TAP, would it be possible to have TAP on FlyAway Buses too? I think it’ll be simple to do TAP on, deduct seven bucks and off you go to Union Station. I love this. It seems that every time I take FlyAway from Union Station, I either just miss a bus (when I’m going to LAX) or just miss a Gold Line train (when coming from LAX) because of the stupidly slow ticket booth. Just a person: Yes, there is actually a drop down menu for number of passengers on the ticket order form. You can buy tickets for up to 10 people in a group. They will all be on the same barcode (I believe), so you would have to be traveling together (use all 10 at the same time). My guess is you could still hand your printed copy (or email the digital version) to someone and they can use it. The barcode will show as invalid after the number of uses you’ve purchased (one for one-way, two for round-trip). The FlyAway is a perfect place to start testing out distance based fares for buses using TAP. Why should the FlyAway only go to Union Station for $7? Why can’t it make a stop at the Silver Line or Blue Line Station on the 105 for $3.50? Why can’t it stop at 7th/Metro for $5.00? Just utilize TAP and do tap in and tap out. Tap-in upon boarding the FlyAway bus at LAX, tap off at the Silver Line or Blue Line stop on the 105, deduct $3.50. Tap off at Union Station, deduct $7.00. Why can every other city in the world be able to do something simple and logical like this while LA can’t? Seriously, why waste tax dollars on creating a smartphone app when you can just use existing TAP technology? Geez! FlyAway to Union Station and Van Nuys is operated by a private company and they are not using TAP. But I’m sure Metro didn’t bother to reach out to them either to tell them it is open to all public transit services. For now, online ticket purchase is probably the best solution because everyone can do it. The problem with forcing FlyAway to adopt TAP is you will have to install Metro TVM at every terminal at LAX… who is going to pay for that? The only other improvements I will suggest… Metro should accept FlyAway ticket as proof of payment for onward travel from Union Station and Orange Line, just like Metrolink tickets. This is the best news ever! I always hated that it’s the same line for people getting off the FlyAway as it is for people getting on, forcing people rushing to get onto a bus waiting behind people who already got to where they needed to go! And as for people complaining about not having TAP, FlyAway isn’t (typically) used as a very frequent mode of transportation. It seems like it would be a costly project for something that would be a mild convenience for a small group of people. And Steven P., “every other city in the world” HARDLY has a system even remotely close to what FlyAway is! Look at Vegas! They don’t even have Super Shuttle for crying out loud! I think we’re lucky to have a relatively cheap and reliable ride to LAX, and this just made it even easier. Your idea for distance-based fares might be an experiment better used by a bus or rail system, not a privately-owned, single-destination airport shuttle bus. With all those extra stops, how long would the ride all the way to Union Station be? Well over an hour would be my guess. Why ruin a perfectly great service for a “trial”? I agree with Irwin, it would be nice to use FlyAway tickets the way Metrolink does. It may encourage people to use transit that maybe otherwise wouldn’t.